You should send some cool MOCs to BFAL2014! We had a good turn-out last year, and I think we're already on track to surpass our numbers from last year! That's awesome. Keep building things and don't forget to send them in! PM me for my address. On Saturday, a handful of my friends came over to my apartment. One of them brought along newly released Injustice: Gods Among Us. We began playing the story and much to our surprise were immediately intrigued by the depth of the story a (for fighting game, at least). Seeing your favorite super heroes become super villains isn't necessarily the most unique idea, but the story is blockbuster-y enough to warrant the 4 to 5 hours straight it took to finish the story line. On more than one occasion we had to verbally refresh ourselves on where the story had taken us and where exactly we were taken across the universe. Even after beating the game in one sitting Saturday night, I went to Best Buy today to buy the game for myself on Sunday. I'm the first to admit that I'm not the best at fighting games by any means, but Injustice does a fantastic job of introducing unfamiliar fighters to the genre while still layering in the mechanics that would make any enthusiast grin. Picking from a handful of the biggest DC heroes and villains certainly adds a layer of appeal to me as well. I've only spent about 2 or so hours practicing my skills outside of the singleplayer campaign. If you'd like to clash in a few practice rounds against me, feel free to send me an invite on Xbox Live. I logged into the forums to update the Staff History topic (Thanks, Ziko!) and noticed I had a birthday topic I hadn't checked out yet. A few people commented about my inactivity on the forums. Over the past six months I've started a real job and moved into my own apartment. Full-time work takes a good bit of energy out of you, and I chose to relax mostly by watching Netflix, Hulu or playing my Xbox with friends. I hate to admit it, but BZPower isn't always on my mind when I get home. However, I still get ALL reports sent to my phone and tablet. I will always have an eye out on BZPower. This website was probably more influential in my teenage years than I realize, so I'm never going to fully abandon the site. I was the Bionicle coordinator at BrickFair Alabama this year, so I've still got at interest in LEGO and BZPower. And there are tentative plans in the pipeworks for a few things that would require more of my (and some other staff) direct attention. So while I haven't been the most active staffer, I still hang around and log on every once in a while. I may not post or blog every day, but I'll never go away. And thank you to everyone for the birthday wishes. I had a great day! The new year is right around the corner, and soon after that is BRICKFAIR ALABAMA 2013! I've volunteered to be the Bionicle Coordinator and I'd love to see as big a turnout for MOCs as possible! If you do plan on sending anything (even the smallest MOCs count! ), be sure to read the article and PM myself or Andrew. We may only have a few short weeks, but what else have you got to do on your holiday breaks? I hope you all had a very Merry Christmas and have an even better new year! Over the past three weeks, I've been in contacts with a federal contractor in the hopes of landing an application development/programming job here in town. The recruiter for the company ran across my resume and contacted me to set up an interview. The very next day, I interviewed at a Starbucks with the Program Manager for the company. The interview went extremely well, and I was told I had a great chance of getting the job, barring some horrible background results came back from the check. Two weeks passed and I hadn't heard back from anyone from the company. I assumed the worst. The same day I decided to contact the company, I got an email saying I was being considered for the job. Since then, I've been in constant communication filling out form after form. Tuesday, this week, I officially signed a letter accepting the position! My first day on site is tomorrow. I assume I will be flooded with paper work and people asking for my signature. I can't get on any of the computers before my security passes since I'm working on an Air Force Base. All day I've been jittery and nervous considering this is my first professional job. I guess this is why I went to school for four years. Alright, guys and gals. Halloween is just around the corner and I don't have a costume yet. Two ideas popped into my head recently and I need your help deciding between the two choices. Handsome Jack, I think, would be a much cooler costume if I could find all the necessary components, but would be a bit more expensive. If I chose Handsome Jack, I'd also probably wear the costume to PAX East 2013 and get some fake internet karma points. 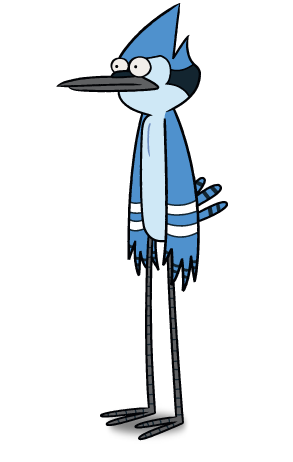 Mordecai would win the "awesome" award, at least at most of the parties I might attend. It would be EVEN BETTER if I could find someone to go as Rigby (but likely won't happen). And the biggest pro for dressing up as Mordecai, he would probably be much cheaper than Handsome Jack. So! I need your opinions. If I had a bunch of money I'd go as Corvo from Dishonored. Boy, has time flown over the past few weeks. Without meaning to, I recently slipped in to a bout of inactivity. I've managed to hop on the forums for a few minutes here and there, but I wasn't able to get much moderating done. Quite a bit has happened over that stretch of time, so here's a quick little update on what's been happening in my life. Over Labor Day weekend, I visited Nate (Than the Moa) in Minneapolis, Minnesota. I flew out early on a Thursday morning and arrived a few hours later than anticipated since my flight out of Atlanta was late getting in causing me to miss my connecting flight in Houston. When I landed, I caught up with Nate at the airport. Over the weekend, we managed to visit Eau Claire and Chippewa Falls, Wisconsin. Nate graduated from the University of Wisconsin in Eau Claire, so it was neat seeing the place where he lived for four years. One of our favorite beers is brewed in Chippewa Falls, so we visited the Lienenkugel's brewery. I've never had a brewery tour, so it was cool to see a small-to-medium sized brewery house. We even got some free samples! Later in the weekend, we rented bikes and rode around Minneapolis. The scenery was absolutely stunning around some of the lakes and the weather was equally pleasurable. I couldn't have picked a greater time to visit. I enjoyed every minute (Friday morning was kind of rough, though...) of my visit and it was great catching up with one of my best friends in person rather than over Xbox Live. Now, for a sudden change in tone. A few months ago, my family found out that one of my nieces (they are twins) has a benign tumor growing between her chest and heart. When I first heard the news, I was somewhat shocked. How could my sweet, precious niece who isn't even a year old have some sort of twisted sickness growing in her body? It felt wrong. It felt like a violation. My sister and brother-in-law took her to some of the best pediatric doctors in the country and received similar suggestions from both, a relief to our family. The precious girl needs surgery. The sooner the better. The operation was schedule to be about a week from now, but problems with anesthesia during a last-minute CT scan has postponed the surgery. It is difficult for me to come to terms with how this may affect my niece. Having to cut her body open feels like a major violation of her innocence to me. The sweet baby girl has been a trooper since before she was born and I know beyond a shadow of any doubt that she will fully recover from this surgery and live a perfectly normal and healthy life. Still, prayers (if you believe that way) and positive thoughts are highly appreciated. This is the main reason I've been absent the previous two weeks or so. The twins' first birthday was a week ago. And now one of them will be undergoing surgery soon. I'll probably be caring for my nephew whenever I'm needed over the coming weeks, so activity on the forums may still be scarce. Lastly, if you didn't know or needed reminding...Borderlands 2 is an amazing game and I am completely addicted. Does anyone else read these marvelous fantasy epics by George RR Martin? I have been deeply enthralled by everything Game of Thrones for about the past year. I'm currently on book three, "A Storm of Swords." I have always been a fan of fantasy novels, but these stories offer something different. Throughout the books (and HBO show), we have seen and heard whispers and rumors of a deeper magic lying dormant in Westoros. After hundreds, possibly thousands of years, that deep magic is starting to awaken. The twisting political intrigue of the series is highly captivating. As I've been reading these books, I can't help but let my jaw hang wide open as certain characters betray their liege lord's (and the reader's) trust. These thousand page books take a large investment of time. I am definitely a fan, however, and I cannot stop thinking about what's going to happen as I turn each page. A sincere effort must be made to not continue reading well into the morning. Many nights I've stayed up way later than I anticipated because I've been completely absorbed in Arya's unfortunate circumstances or Jon Snow's risky actions. I wish more of my friends read the books. We have to wait another year for the HBO show to release, and I believe even then only half of the season is premiering. "A Storm of Swords" is over 1000 pages, so it only makes sense that it would get two half-seasons. Edit: UNGH I just got to about page 700 and never have I been so full of RAGE and ANGER and HATE. Seriously. What just happened. Who here likes fantasy books? What would be other good series I'd enjoy reading? After I catch up on A Song of Ice and Fire, I'm going to read a sci-fi novel or two. Possibly Ender's Shadow or Restaurant at the End of the Universe. I'm an achievement hunter. I like earning fake internet points in my video games. I mostly like adding games to my "100% Complete List" on my dashboard. So, this weekend, I'd like to earn a few achievements that have been escaping me for a while now. I'd like to start off with Halo: Reach. Great game, tons of fun, a bunch of people have it. Would you like to join me? You can add my gamertag: mrmobado. I'll be online anytime between this Friday, 8/17 to Sunday, 8/19. All of the achievements I need in this game are DLC specific. If you'd like to play with myself and whoever else joins (Kaleesh, Sonu), please have the Defiant Map Pack specifically. The other packs are fun and you should totally buy them too. If you'd like to play, just comment on this entry and let me know. The more people the better. I'd at least like to have a full team so I can unlock that dern 1-Flag achievement. You can totally earn some achievements too! I won't be a dictator over the party. If you want some achievements, we can help you out too. Oh, and if you have Borderlands, I'd like to play that this weekend to. And kill Crawmerax. So be ready for a bad time. Well, now I know! Anywho, what I commented was this: Please note that this game is M-rated and your parents have to be totally cool with you playing this game. If there's one thing you should know about me, it's that I absolutely love traveling to new places. Just this year, I've traveled to Boston, MA, Orlando, FL, Ann Arbor and Grand Rapids, MI. This Labor Day weekend I'm looking to add another city to my list: Minneapolis! Some of you may have paid very close attention and noticed that Nate (Than the Moa) recently moved to Minneapolis. Put two and two together. Yup, I'm going to visit Nate! We're gonna hang out and stuff. Probably hit up some local bars, visit the Mall of America (always wanted to visit), and probably play a little bit of Halo. Just gotta buy my tix. First off, congrats to Nate and the rest of the staff that worked really hard (in their spare time, mind you) on getting this new skin pushed out. It wouldn't have been possible without great cohesiveness and teamwork. Good job guys. Nate did a superb job of capturing the tone and theme of the old forums while still giving us a contemporary feel to our favorite website. Everyone is entitled to their own opinions. Do not be taken aback when people get defensive or unsettled when you let it be known that you do not enjoy the product of their own hard work. Many hours went in to creating this skin. The staff as a whole put in our thoughts and concerns to Nate about colors, styles, and buttons. You do not have to like the skin. Certainly, Nate and I are open to criticisms of the skin overall. Try to be as descriptive about what you do not like about it, and we will take these statements into consideration. There is a difference between "bland" and "warm", the latter being the feeling Nate was targeting in his overall design. The skin creates feeling of warmth and invitation. Muted colors tend to evoke these emotions. The few hints of brick red and even subtler hints of yellow spark the more feelings of flare and zing that a few members seem to desire in a site's design. And hey, we may even have a way for more members to voice their opinions on the skin soon. We know a bunch of you guys are really talented, so why not take advantage of that? Let's all be respectful. People worked hard on this, and we welcome criticisms that are thoughtful rather than just provoking. Christopher Nolan delivers, again. I could not have asked for such a great conclusion to this trilogy. Much in the same way he captured Joker, Catwoman and Bane lose much of their ridiculousness from the comics to give us much more realistic and gritty characters. Anne Hathaway, in my opinion, did an excellent job convincing me that she holds no allegiances to anyone but herself. Tom Hardy played a great Bane, even if he didn't get to shine much as an actor. Joseph Gordon-Levitt is quickly becoming a favorite actor of mine. Is it better than the Avengers? I couldn't say for sure, but it is certainly a great movie for completely different reasons. Once more people see it we get to talk about those sweet, sweet SPOILERS!